Imagine that a typical kid from 1975 is suddenly transported through time to the present moment. He’s walking down a neighborhood street and sees cars going by that look futuristic to him, but otherwise he is reassured that things look pretty much the same. He keeps walking around neighborhoods and occasionally he’ll see cars drive up to a house and see adults and kids walk quickly inside while looking at some device they hold in their hands. He thinks this is strange. This kid starts to wonder if there’s been some government order to stay indoors. Finally with some relief, he finds a ball field and sees kids playing little league baseball. He runs over to see if everything is normal. The boy is not reassured. He continues to see the parents looking at these strange devices and sometimes touching the screens and watching them intently. Now imagine this kid is whisked back to his own time. He tells his friends that in the future everyone has a little device the size of their hand that the look at constantly. He thinks maybe they get all their instructions from this thing and everyone must be brainwashed or in a trance or something. He explains to them that kids don’t play outside, except for organized sports. Instead, they have their own devices they stare at all the time. The only exception he saw is when kids are playing organized sports. While the kids play their organized sports though, the adults continue to look at their devices. He surmises that something happens in the future that put everyone under mind-control. His friends laugh and say he’s been watching too many “Twilight Zone” episodes. But he knows what he saw. Now back to our reality. Can you say it’s not true in your life: that you’ve got a screen in front of your face too often? How many times have you ignored or tuned out your child because you are into Facebook or some other essentially pointless activity on your phone? Probably as many times as you’ve been tuned out or ignored by your kids doing the same thing! Can you safely say that your family hasn’t succumbed to the creeping takeover of “smart” phones and “smart” TVs in your home? If we are honest with ourselves, most would have to admit that they’ve let media technology take over too much of our attention and time. 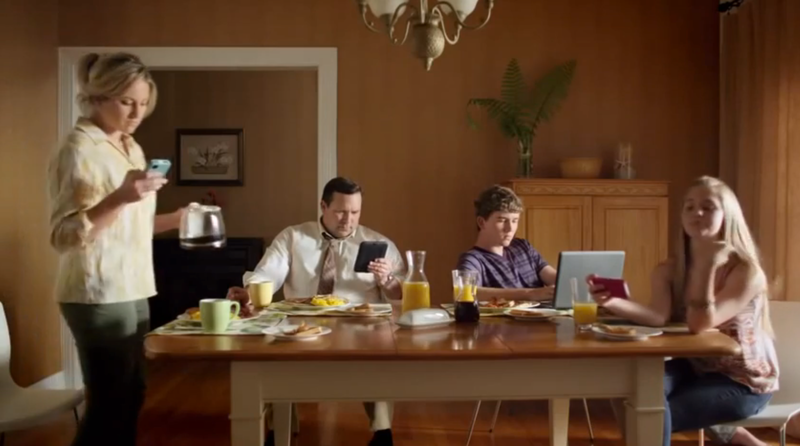 Moreover, we’ve let media technology invade our work and family time and not just our spare time! It actually has the ability to rob us of our valuable time. When we are focused on social media we lose our time in the present moment. We miss it! When we aren’t present in the moment, we actually don’t make memories of those moments. Do you really want to go through this summer with your face in front of a screen? Do you want to remember interactions with your spouse, family, and friends or not? If you want to be present and make memories this summer, and if you want to experience quality time in your relationships, then PUT THE PHONE DOWN! It’s a challenge I launch not only at you, but also at myself. While this may seem counter to what I’ve just said, I encourage you to check out this website to learn more about how to effectively unplug from technology this summer. They have real-life testimonials from families that have incorporated a “tech time out” into their weekly family routine. Try it for yourselves!